Shake with ice and strain into a Collins glass filled with ice. Top with soda water and add a straw. (*) Infuse 1 cucumber (sliced) into 1 bottle of Pimm's for 12 hours. Strain. Two Thursdays ago, after celebrating a belated birthday dinner at VeeVee in Jamaica Plain, we traveled down Centre Street to The Frogmore for a second dessert and a round of cocktails. 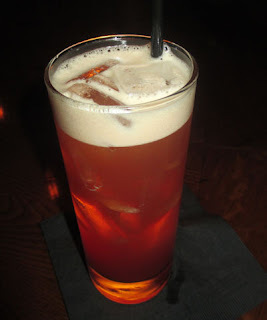 For a drink, Andrea asked for the River Queen which was their Pimm's Cup variation. Bar manager Alex Homans later came by to talk about their program and how they are using creativity to make the most of their cordials license, as well as to explain how they make their cucumber-infused Pimm's for this drink he created. The River Queen offered a fruity herbal aroma that transitioned into a watermelon and berry sip. The swallow offered the cucumber and Campari flavors with a hint of ginger on the finish. Two pairings here stood out: the first was the more obvious one of how cucumber and Pimm's play well together, and the second was how ginger worked with the Campari to bring about an elegant bittersweet spiciness on the swallow.